Granblue Fantasy is huge in Japan. Enormous. The game is a smash hit. It’s been downloaded over five million times, and there’s a newly announced anime. Yet, you’ve probably never heard of Granblue Fantasy. Maybe you have! This free-to-play PC and mobile game has quite a pedigree. It has music from former Final Fantasy composer Nobuo Uematsu and art from former Square Enix art and graphics director Hideo Minaba. No wonder this game has airships. Cygames developed Granblue Fantasy and at this year’s Tokyo Game Show, the studio has only one game on display: This. And the Granblue Fantasy booth is one of the biggest at the show. The booth is the same size as Sony’s. And for one game. In real life, it is not this blurry. The game is a turn-based RPG set in a Castle in the Sky sort of world where people live on floating islands and travel in airships. Players take on the role of a young protagonist who, through a turn of events, rescues and must travel with a young girl with a connection to an ancient, powerful, long-lost race. Together, with various other characters, they fly the airship the Gran Cypher from island to island avoiding the pursuing wrath of an evil empire (stop me if you’ve heard this story before). I’m playing, but honestly the jury is still out on whether I really like this game or I’m getting caught up in the hype. Oh, hi massive two-story screen advertising the game. Massive. Fantasy, huh. I’ve heard that used by another JRPG company. I think. There’s a giant building behind the screen. It houses a theater. Truly one of the most impressive booths at the show. Coming to Tokyo Game Show by train, the very first sign of the show one will experience starts with walking down the stairs seeing a long line of posters advertising the game. Many Japanese gamers have the Granblue Fantasy bug, and have it bad. One of the game’s biggest draws is powerful rare characters, weapons, and summons that can be brought into your party by a random draw called a gacha. For 300 gems, a player can roll a gacha, or for 3000 gems they can roll for ten at a time with at least one guaranteed “super rare” or rarer. Gems are obtained in the game or they can be purchased for real money, and purchase them people do. Where once my private twitter feed was full of people tweeting about how much they had sunk into THE iDOLM@STER Cinderella Girls, it is now full of people tweeting about how much they’ve sunk into Granblue Fantasy and the pretty rare characters they’ve gotten. 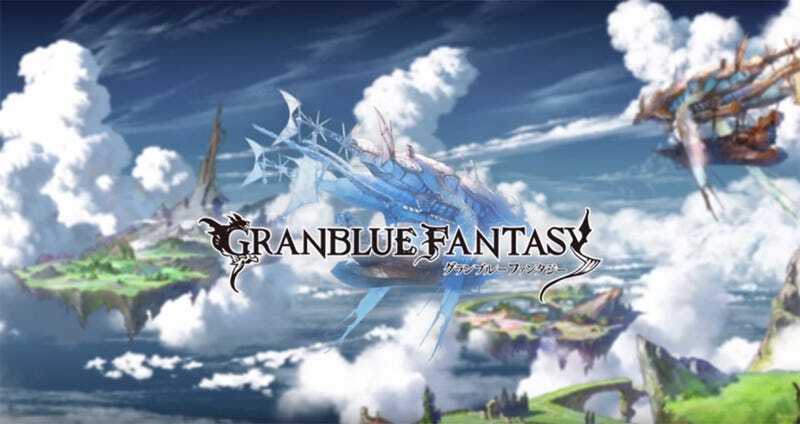 Granblue Fantasy is currently available in Japanese for iOS and Android platforms. The game is also playable on PC with Google Chrome.